Having landed on the island, the three Britons and another rower refused to continue because of safety fears. Only the boat’s Icelandic skipper and an American crewman wanted to keep going. It is understood the stranded crew may not be evacuated from the 144 square mile island until next week but are being looked after by an 18-strong Norwegian military contingent based there. Last night the Maritime & Coastguard Agency confirmed it had received an SOS. The team was being led by Icelandic athlete Fiann Paul, and also featured Gregory, fellow Britons Sam Vye and Danny Longman, and Americans Tyler Carnevale and Carlo Facchino. 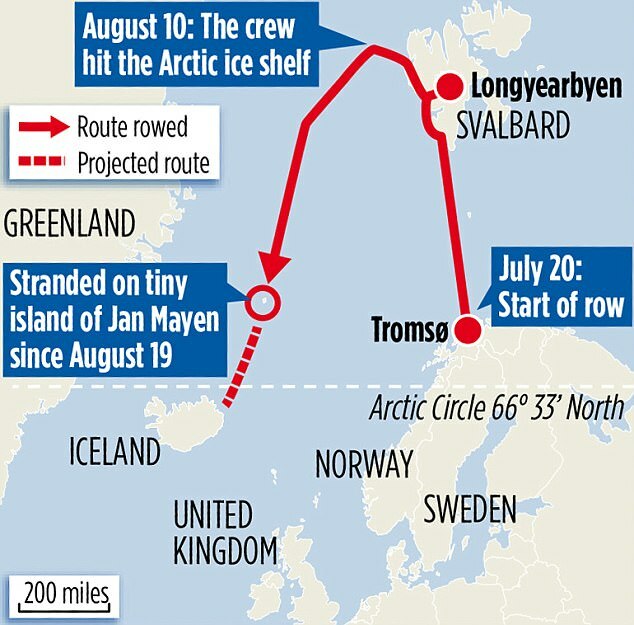 The expedition set off on July 20 from Tromso, Norway. Gregory posted an emotional video message on Twitter after arriving on Jan Mayen on August 19, in which he described how the crew had been taken in by Norwegian military personnel who had ‘saved our lives’. The bravery of these guys is astounding, and at least on this occasion the purpose was a charitable one, to raise funds to build a school in the Himalayas. But time and again we find these expeditions set out totally unprepared for what to expect, lulled into a false sense of security by fake claims of Arctic heatwaves and icemelt. Sooner or later, these fraudsters will have lost lives on their conscience. Do we know how much money they actually raised, after the costs of the expedition and rescue were taken into consideration? That Himalayan school has to be built at any price. “Helping the mountain people of Nepal help themselves” is the quote on the CAN website. I’d imagine by the time the full costs are taken into account, the expedition cost as much as a school. I cannot stand these people who pretend that their adventure, which they want to do, is for charity. Surely the reason for abandoning the expedition has nothing to do with ice, melting or otherwise – it’s because of storms. Failed because they went to the magnetic pole? Certainty a long way from the true pole. Otherwise seems like a pretty strenuous feat. It would be useful if you could enable a link for each new article so that it can be shared on Facebook. It would also be a good idea for you to have a Facebook page, so that people can get new articles directly into their news feed. Not sure he has the same knowledge of these parts as you? Dunno the guy.. Usually these x-plorer folks have done their theoretical homework ad nausium, considered the major premises, minor premises and their derived conclusions. But the real physics of the problem out on that silent land is non linear, and needs more MacGyver and less lawyer for every timeline iteration that presents itself along the way until you succeed or fail up/down the rabbit hole you dig. Makes one think of Shackleton’s journey in ‘James Caird’ and then crossing South Georgia when the alternative really was death for the whole crew. I doubt that the fraudsters have any conscience. As one who explored for minerals in the desert near Lake Disappointment and other dangerous places before GPS even, allowing your communications to power down is both suicidally poor planning and unforgivable lack of experience. Geoff. I’ve had this blog on my favourites bar for some time but got out of the habit of visiting it which I will now do again on a regular basis. Excellent blog keep up the good work. The bravery of these guys is astounding. The stupidity even more so! I don’t see bravery. I see foolhardiness. It already happened a couple years ago. I also remember having to re rig a ski on a Twin Otter on the ice strip in Grise Fiord under cover of a pup tent. Half an hour into it, a shot rang out and shortly after, one of the locals pulled up with a BIG polar bear strapped to his Komatik.. still steaming warm. Apparently it was headed our way, nose in the air, looking for an easy meal. Be careful out there. Don’t believe the spin that the Polar bears are gone. So I guess the small journey to the ice shelf was the only bit tacked on. “With four new rowers Team Polar Row set off to sea once again on the 7th of August and decided to extend the project by adding a row North towards the Ice shelf. This was an exciting upgrade of their original plan and turned into an extraordinary part of the expedition. 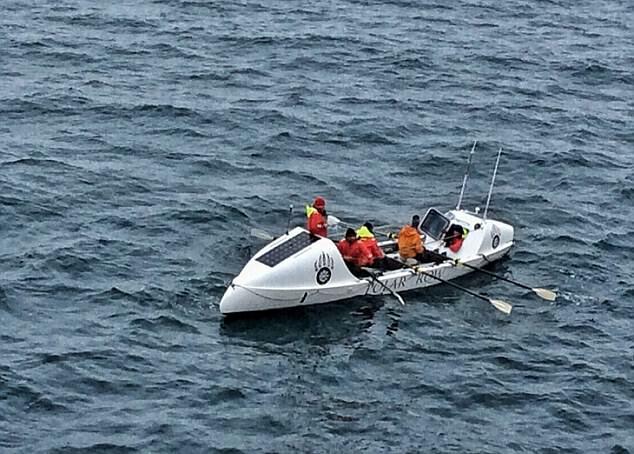 On August 10th the crew hit Arctic sea ice at 79 degrees 55 minutes North, therefore becoming the first recorded rowing boat to row to such a Northerly latitude. It appears that the NHC is calling Hurricane Harvey Cat 4 on the basis of a sole of 132mph. Of course, the extremely heavy rain will likely end up doing enormous damage and the flooding may cause significant loss of life – but that comes about because the storm is now static. Were NHC tempted to over-hype the winds and bolster the category, hoping no-one would notice? The measurements they have presented suggest that it may have been no more that Category 2 for sustained winds. Not the NHC. The Weather Prediction Center is a minor back-up department desperate to stick its nose in where it is not authorised. Of course, we know warmunistas everywhere weep with sexual joy whenever a weather disaster happens. Dave, that 115Mph is not at ground level where it is supposed to be for categorisation. It was more like 125Kph which is around 80Mph, both on NUSchool and Bouy data. It’s all part of NOAA, and the WPC link comes directly from NHC’s regular advisory reports. Yes. Noted; 115 knots not mph. and I made a wrong assumption. I am going back to my original statement. The unit IS mph when the National Hurricane Center issues its public advisories! This – latest – advisory states 40 MPH. I believe Maue uses the figures for max wind speeds as they appeared in these advisories at the time (before ‘reanalysis’ of course); and so MPH does seem right. The 1-minute average seems really short; the rest of the world uses a 10-minute average. To really, really confuse things, I now think Maue does use knots for ‘intensity’, as forecast in real time. 115 knots was the forecast. But the later, actual satellite measurements showed the forecast to be wrong! ‘Harvey’ peaked at 100 knots which equalled 115 mph. Of the sighting, expedition leader Pen Hadow said ‘This is another bittersweet moment during our voyage. The mother and cubs looked in good condition from afar, but the juvenile appeared to be in a challenging phase of its life. The good news is the essential food chain is currently supporting these bears. The cautionary twist is that survival may be marginal, and any new and avoidable risks to the food chain should be controlled by international policymakers before it is too late. Pretentious crap from a graduate reader of Roy of the Rover. Further reading reveals that this was blogged from the CENTRAL Arctic Ocean at 76°35’N.!! A.K.A.. an unelected World Government of apparatchiks, (doubtless with a place for Mr Hadow as a well paid “expert”). I recommend a book by Francis Neilsen M.P. published in 1916 “How Diplomats Make Wars.” Dangerous and evil fools combine everywhere and always. Reminds me, what’s that other serial Polar self-publicist Hadow getting on? Seems a bit chilly to me. Not the central Artic ocean yet then! And polar bears cavorting all over the place it seems. They seem to have changed their minds. Getting Ready for Hottest Ever stories ? “Since the late Bank Holiday in August was established in 1965. So I am guessing it is probably not even the hottest August 28th on record. Will it be the old laser pen on the thermometer trick at Heathrow ?